Patios are not a small investment to make, but a lot of people do it, because it adds a lot to your home’s perfect exterior. If you have a patio, too, then you probably need someone to clean it for you. Our company would advise you not to try and do it on your own, because patio cleaning is not in everyone’s abilities. Be safe, and call our company now. 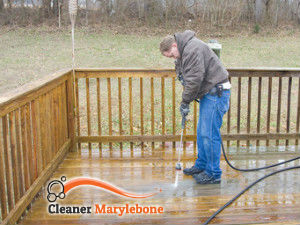 We promise you the best patio cleaning service you will ever find in Marylebone. Trust us with your patio and call us now. Our cleaners can get rid of stains, discolouration, grime, dust, moss and slippery algae, weeds and grass, as well. Our cleaners are equipped with the latest pressure washing machines, and we can say that thanks to them they will clean even more quickly than usual, and with minimal to none disruptions to your home exterior or garden. Our cleaners are very diligent and they are professionally trained to keep their work clean, they will ideally clean your patio, driveway and decking, without damaging flower beds, decorations, furniture, etc. We have small and big pressure washing machines, and we assure you our cleaners will give you outstanding results. If you want the best for your patio, and want to have it look fresh and brand new, you need to call our company. 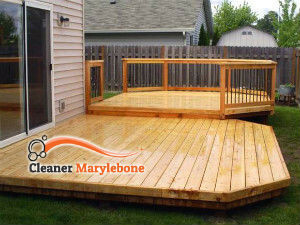 We assure you our patio cleaning service is the best one you will find in Marylebone, and we have the best prices. Call us and see for yourself. Copyright © 2019 Cleaner Marylebone. All Rights Reserved.